One of New York City’s prime wedding photography destinations is Central Park in the heart of The Big Apple. There are many outstanding landmark locations around NYC for an urban look or to capture the essence of it’s legendary architecture, but when it comes to a park-like environment there is nothing that can rival Central Park. Elsewhere on this web site you will see images from my favorite photo locations in Central Park. Of particular importance is the area surrounding Gapstow Bridge in the park’s southeast corner, just a few minutes walk from the Plaza and Parklane Hotels. This picture was taken in the pedestrian walkway that goes under Terrace Drive in Central Park. Accessible only by carriage, pedi-cab or walking, Bethesda Terrace is one of the most popular spots in the city’s legendary outdoor playground. On this particular day there was no less than 5,000 people within 200 yards of where this picture was made; yet the New York spirit shined through and all of the bystanders gave us the room we needed to capture this beautiful image under Bethesda’s timeless arches. 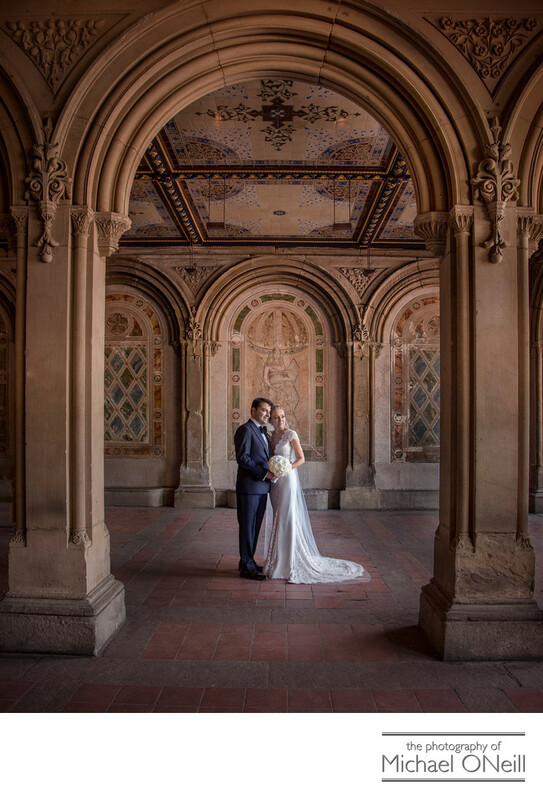 If you are planning a NYC wedding be sure to choose a photographer who is fluent in the great Manhattan photo locations, and well-versed in the logistics of creating great wedding pictures in NYC.